No matter what you're requirements are! Liverpool Community Transport is committed to providing a high quality service to all our groups and organisations. However we do recognise that mistakes or delays can occur. We therefore welcome your feedback and will undertake to deal with your complaint quickly, fairly and in confidence. Poor customer service e.g. where you did not get the level of service which you feel you are entitled. You may make a complaint in person at 14 Grundy Street, Liverpool L5 9SG, by phone on 0151 207 5400, by completing the comments and complaints form below. If you wish to make a comment or suggestion, you can contact us on the above telephone number . It is our goal to resolve complaints as early as possible, the Operational Transport Manager is the first point of contact. However if this is not satisfactory you have the right to have the matter examined by the Board of Trustees. Your name, address and email address (optional). A daytime telephone number, if you would be happy for us to contact you by phone – this may help us to resolve the matter more quickly. Exactly what aspect of our service you are dissatisfied with. The name of the staff member who dealt with you (if known). Any complaint will be answered within 14 days. Complaints or suggestions will be promptly passed on to the Operational Transport Manager. All complaints will be treated promptly, fairly, impartially, and in confidence. We guarantee that your complaint will not affect how we treat you in the future. Note: Nothing in this complaints procedure affects your statutory rights under the Freedom of Information, Data Protection or any other relevant legislation. The contents of our Complaints Produre is reviewed annually and/or when changes in legislation are introduced. Do You Have A Complaint About A Service We Have Provided? Please let us know about it, it may be too late to rectify it but we'll make sure that it never happens again! To help us understand and address your complaint, please let us know all the relevant details, such as; the date, and time of the issue, any individual from Liverpool Community Transport (if applicable) that may have been involved in the issue and the reason for the complaint. Please be reassured that 'Liverpool Community Transport' will not share your information with any outside organisation, except as part of providing a product or service, or when legally obliged to do so. I confirm that I have read your Complaints Procedures above. Did you know that your organisation could loan one of Liverpool Community Transport's fleet of safe, reliable and accessible vehicles? For over 40 year's, we have been carrying out class 5 safety inspections for community groups/ schools throughout the City. Liverpool Community Transport's Testing Station is approved by the Government appointed Vehicle Operator Service Agency (VOSA). Is your group looking to plan a bike ride? Well look no further, Liverpool Community Transport have 15 bikes available for hire. Liverpool Community Transport provides customers with guaranteed parts & labour in all vehicle servicing schedules, tailored to your specification. We have a very affordable training room for upto 12 people for hire, which serves local businesses, community groups and councils. 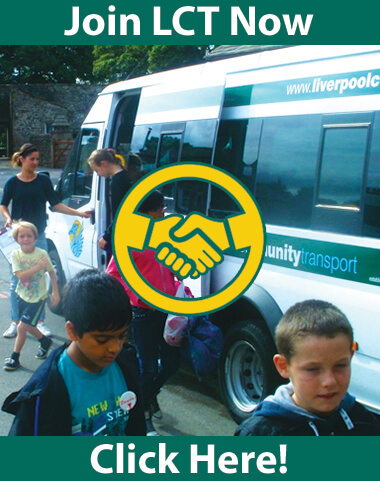 Liverpool Community Transport is a registered charity set up in 1972 with the aim of providing community groups, schools and community and voluntary organisations around Merseyside with a safe, affordable, reliable and accessible transport provision. Since 1999 LCT has held contracts with Liverpool City Council to transport children with special educational needs to and from school. The number of these contracts has grown steadily year on year since the introduction of this service into the organisation. We have been involved Liverpool Community Transport for over 35 years it’s a pleasure to work with them! We happily ENDORSE Liverpool Community Transport as a serious option for all your requirements. The cost of hiring a minibus for the four weeks of the visit is beyond our means and the support of LCT allows us the opportunity of helping these very special children. Fantastic service and support during our Annual International Conventions! Copyright © 2019 Liverpool Community Transport.